Contact Ebert Law Offices, P.C. 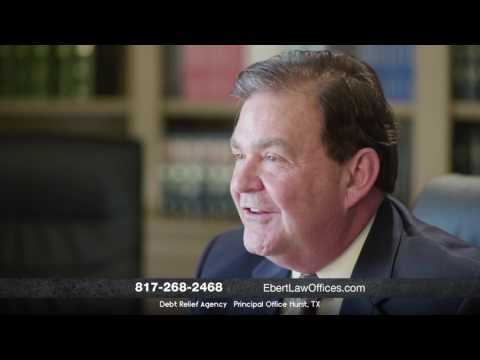 Ft. Worth bankruptcy attorney David Ebert has been helping Tarrant county residents get a fresh financial start for many years. Contact us today to set up a free consultation. East on JIM WRIGHT/NE LOOP 820 toward Karen Drive. Turn RIGHT onto HARWOOD RD. From the Mixmaster, Take I-35W north to the TX 121/I-35W interchange. Take TX 121 approx. 7 miles to the I 820 North/TX 121 north interchange. Proceed on TX 121 N./I-820 N for approximately 1 ½ miles. Take I –20 east to the I-820/I-20/US 287 N. interchange. Take the I-820 N. exit. Proceed on TX 121N./I-820 N for approximately 1 ½ mile. Turn right onto WEST HARWOOD ROAD. Turn right onto CHADWICK COURT. Take I-20/US-287N approximately 1 mile EXIT onto the I-820/US 287 N.